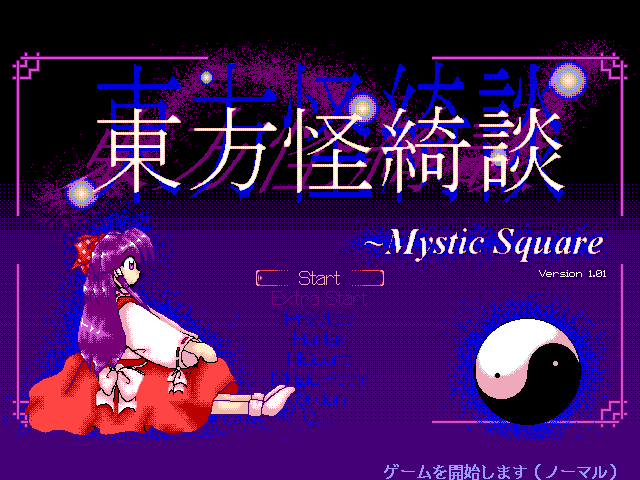 This is an unofficial port of the game 東方怪綺談~ Mystic Square to windows. It faithfully reproduces almost all features of the original PC98 version. I'm not original owner of this project, but I luckily found this thing and am going to finish this project. I don't have gift of gab, so if you have more good idea or know what I should not to do in this introduction, please let me know. I didn't know that stage 2 and 3 is not same with original game, if you tell me more, I'll try to fix that. And this is extension of the Chinese port, what you thinking. And Skill Verdict Screen is implemented although not completed. Death, Bomb Used, Slowdown, Focus and complecation calculation is not implemented yet, but soon It will be. Alright... interesting, I'll check it out as soon as I can. Yeah stage 2 (not 100% sure) and stage 3 have only have marginal differences from the original, just an enemy or two that don't shoot bullets. It's good to see that the skill verdict is being worked on right now . Also I'm assuming there's been a reduction of input lag as well? Okay, I found them in stage 3. Not one or two, perhaps ten. So although you collide with them, you will not die, if you didn't die by other bullets. I don't know why they are happen, so fixing this would take some time. And input lag, can't be reduced. 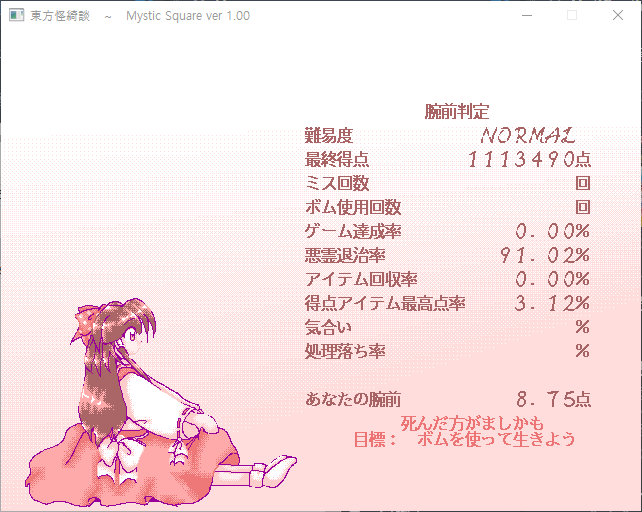 Because of accuracy, original code get one input per one frame, in PC98 version's speed. And I think it would be not good to fix this.